Ok hotel , quiet small rooms . Best part was breakfast ample items for vegetarian also and quality of food was also gr8 and complimentry internet phone was the helpful although it was of not best quality and was very slow . i stayed recently at the Ibis hotel, Novena, and was really happy with my stay. decent hotel, good food, and good rooms. 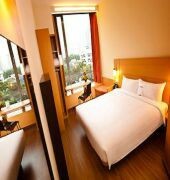 good facilities too in the room, they have complimentary bus service to nearby novena train station and mall. stayed here for business trip, check-in was good and fast. room was clean and good prepared. all staff are friendly and helpful. it is a bit far from MRT around 10 mins walk up and down hills. location is good for relax and get a feeling as local, you can find a local famous restaurant. if you are love to save the earth with green and recycle programs, this hotel will suit you. they don't use a plastic, no drinking water bottle, air-con control. Overall stay was very comfortable. Reception were very friendly and helpful.Breakfast was very good and varied. Room conditions were well maintained. Definitely will recommend to others. The only disappointment was the loud noise from family in the connecting room. One of the most expensive ibis around the world. The hotel was exactly what the average cost was in singapore. Small rooms but convenient breakfast included and a location that can get you where you need to go. Singapore transportation is relatively economic so it was ok. They made a mistake with my reservation but rapidly ammended it and offered a good solution and offered a fruit platter and some cookies which was a good detail. Thank you for your review, I have responded to your internal feedback too. Pleased to hear that we managed to fix the problem, though apologise that it occurred in the first place.